Reception area positions open during the week and on Sundays. We were blessed by a huge outpouring of generosity during Give More 24!. In total, we received $17,281 during the online event alone, and more “at the door”, to provide a total of 943 more “bednights” of shelter for our kids at the shelter this fall! Bless all who helped make it so! Tune in again next year! It is tough duty keeping a homeless shelter open and running 24 hours every day, 365 days every year. We do it because homelessness doesn’t happen Monday-Friday from 8 to 5pm. Fact is, the ones hardest hit are the kids. Their lives don’t stop when the rest of the world checks out for the evening, or for the weekend. In fact, that is when the story can get ugly. Imagine being a toddler sleeping in a car with your mother and four other people, or surviving night-to-night in a cheap hotel surrounded by prostitution and drugs, or sleeping under a tarp under one of the interstate bridges. To most adults, 24 hours is just another day. To a homeless child, one night can seem like an eternity. Every time that we are able to give a homeless person safe refuge for 24 hours, we call it a “bed-night”. 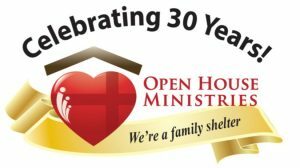 Did you know that the largest percentage of bed-nights at Open House Ministries, by far, is to children under 17 years of age? For them, your gift is a warm, safe bed and a place to call home. For their families, it is a ticket on the day-by-day journey, stepping out of their past, rebuilding their lives, and breaking the bonds of homelessness. On Thursday September 22, 2016, during Southwest Washington’s “Give More 24!” day of online giving, every gift of $19 provides a child another 24 hour bed-night in our family shelter. In his or her own bed. Safe. Out of the cold. A chance for a better future. To participate in this year’s “Give More 24!” on Thursday, September 22, 2016, go to https://give-more-24.org/designee/open-house-ministries . Or give online any time at www.sheltered.org. The kids will thank you for the rest of their lives. Do you shop at Fred Meyer? Support your favorite nonprofit just by shopping at Fred Meyer with your Rewards Card. Fred Meyer is donating $2.5 million each year – up to $625,000 each quarter – to the local schools, community organizations and nonprofits of your choice. All you have to do is link your Rewards Card and use it when you shop at Fred Meyer. You are now able to link your Rewards Card to your favorite nonprofit by following the link below. Whenever you use your Rewards Card when shopping at Freddy’s, you will be helping that organization earn a donation from Fred Meyer. If you do not have a Rewards Card, you can sign up for one at the Customer Service Desk of any Fred Meyer store. Once you have your rewards card all set up, the last thing to do is choose Open House ministries as your non-profit organization.